Where we specialize in Colombian dishes such as our famous homemade Empanadas. Want fresh food right off the stove, homestyle? All servings are made to order, so you are guaranteed freshness with every delicious bite. Pay us a visit on Morris Park in the Bronx and taste the best Empanadas you will find in NYC! Our menu is steadily expanding as we will be introducing new items soon. So stay tuned, and come join us for some genuine Latin food anytime. Hope to see you soon! Great food small restaurant but friendly service, have to try the Bandeja Paisa, excellent service. 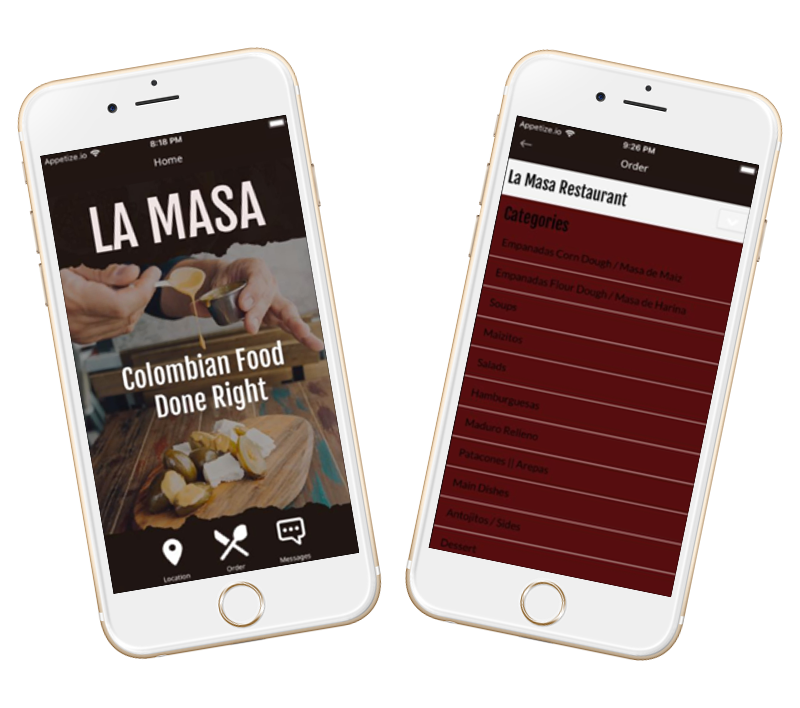 Between La Masa's style and food, I'm not sure which one I like more. I'll be frank with you, I'm... read more not even going to pretend I know Colombian food...because I don't. As a matter of fact, this is actually the 2nd Colombian restaurant I've visited.....in my life. First one over in Queens- but this right here, is a unique breed and I'm liking it. Really digging Masa's modern design with a mix of woods and the Greyish/Brownish flooring. What also caught my attention- are those huge metal letters against orange walls, plus their lighting, adds a soft feel. This is the kinda place where you'd want to linger just a bit and enjoy your food. Place isn't tiny and looks like you can score a seat. But it's probably best to take it to go because seating seems like it could be somewhat limited (especially at night). 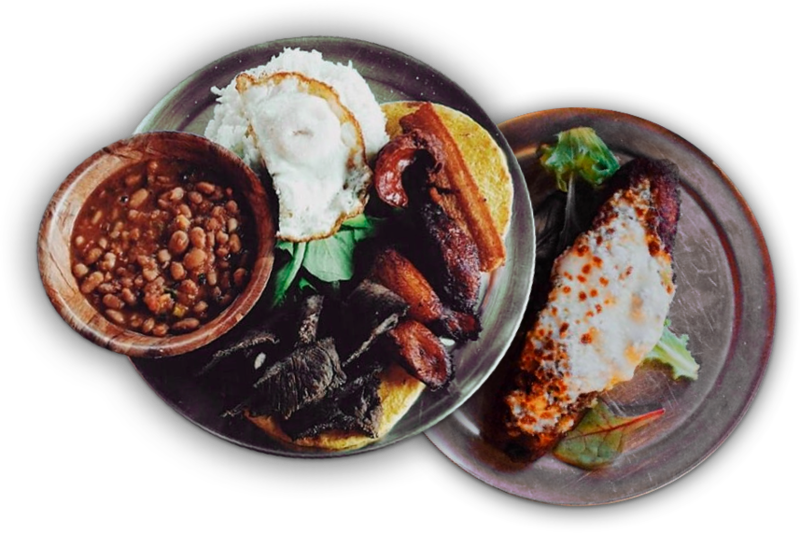 Masa honors traditional Colombian cuisine such as Arepas, Empanadas, Bandeja Paisa, etc. Almost all their dishes call for a chicken, beef or pork- but, there are some, where you can substitute for Seafood. What struck a note is how they give their menu a Vegetarian and Vegan twist (love it). Large selection of Starters, Salads, Entrees, Sides and some Colombian Beverages. Mom and I got there a bit past 11:30 and Breakfast menu looked nice. She decided on a "bandeja" (tray) with steak, sausage, chicharron, Fried Egg, Arepa topped with Cheese and a Red Beans & Rice side dish. It was hard for me to narrow down menu options- because all their Seafood, Vegetarian & Vegan options- sounded good. My Maduro Huevón in the end, was ultimate: a whole Sweet Plantain, slit from end to end, stuffed with Scrambled Eggs and topped with Colombian Cheese. That sucker was real good. The Sweet Plantain (looked broiled) had nice char, crispy where it had to and full of sweet! Also, with a mixed Rice & Beans side dish. Masa wouldn't be complete without Dessert and their few selections sounded real good too. Not a total fan of Flan, but I was eyeing their Passion Fruit version. Turns out, they were out and instead, had a fantastic 'Berry Fool' look-alike! The food was delicious. Our waitress was very good. And OMG the iced coffee and the hot arroz con leche were... read more to die for. If you are vegan, go here now. Yes, it is worth the trip. It's a short walk from the Morris... read more Park station on the 5. Definitely go with a group of people because you're going to want to try all the things. I came here on my birthday for lunch as part of a day-long series of activities, and this was the highlight for everyone. We told the server that it was our first time there, and she helped us order. The reason they have a menu that includes vegan and gluten-free items because a relative of the owner has a medical condition that required her to explore various dietary options to deal with it. So that is how they became familiar with vegan food. The menu has vegan and gluten-free items well-marked. Empanadas - definitely get the Roasted Vegetables. It comes in a corn dough and we all agreed this was the best flavor and ordered seconds. We also tried the Mushrooms & Onions, Beef-Less Ground and Roasted Eggplant ones, which were fine, they just couldn't compare to the Roasted Vegetables. We tried both the Patacones (green plantain base) and the Arepas (white cornmeal base). If you can only choose one, go with the Patacones. We tried both the Carrilero (beef-less ground and cheese) and the Vegan (mix greens, black beans, guiso & vegan cheese) toppings, which were both good. I'm usually not into fake meats, but I did like their beef-less ground. Maduros Rellenos - a whole sweet plantain sliced down center and filled. We got the Beef-Less Ground & Vegan Cheese version. Excellent! Each of those three dishes is served with a side of calentado (rice and beans). Maizitos - an appetizer that is a big bowl of corn. It's good, but make sure you have enough people to eat it or be prepared to take some home because it's very large! They have empanadas of almost any mix you can imagine. Great portions for brilliantly cooked Colombian style cuisine. And to top it... read more off $15 sangria pitchers! This place has really stepped it up since my last review. I've been here a few times and the menu... read more options have been available. There are plenty options for v and veg folks and I must say the best part of it all...the food is DELICIOUS!!! Man I love this spot. Cute and welcoming...the waitress are so polite and accommodating. Suggestions: salad #1 with their housemade raspberry vinaigrette! Black bean calentado! Vegan sweet plantain thing (can't remember the name, lol) minus the vegan cheese (well for me at least...I hate fake cheese)! Lastly, apple pie and roasted vegetable empanada!!! Love this place. Very clean and great food. I love how they have a great selection of empanadas. I wish I can give 10,000 stars to this place LOL. The food is delicious and the whole staff is... read more amazing. The food is so fresh. It might take a little longer for your food to be serve, but it's well worth it (everything is made from scratch). The vegan options are delicious including the vegan burger. Amazing pit stop in the Bronx on the way to the Bronx (New... read more York) botanical gardens. Loyal customer since day one. Amazing staff and amazing food!!! Great vegetarian options too.